On a hike a few weeks ago, we encountered an unusual, and amusing, stile across the trail. It isn't uncommon to see stiles along trails. 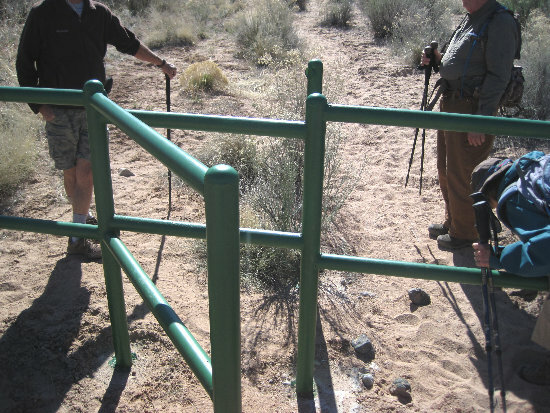 There are lots of different designs, but their purpose is to allow humans, on foot, an easy way to cross a fence, while making it difficult for vehicles and livestock like cattle to pass through. A common design looks like this, with a break in the fence and "wings" so that anything small enough to make the sharp turn can pass through. It was set up so that nothing could pass without climbing over the fence -- and one of the posts which was supposed to hold fence rails was just sitting by itself, with nothing attached to it. I suspect someone gave a diagram to a welder, and the welder, not being an outdoor person and having no idea of the purpose of a stile, welded it up without giving it much thought. Not very functional ... and not very stilish, either! I'm curious whether the error was in the spec, or in the welder's interpretation of it. But alas, I suspect I'll never learn the story behind the stile. Giggling, we climbed over the fence and proceeded on our hike up to the very scenic Otowi Peak.